Some people talk about paper collections 'speaking' to them. The paper tells them what type of projects to create. We want to hear from you! Which of QQ's newest papers are your favorite & what would you do with it? Other PRIZES - Two comments will be chosen at random and each person will win their favorite paper line!!! NOTE: If we reach 1,000 followers here on the blog AND/OR 5,000 followers on Facebook by Aug 15th then the QQ owners are going to give away a 5th FREE Private Reserve Tuition!!! WOOHOO... tell your friends and let's hit that goal! Hi ladies- I love Miss Morgan and made a layout with it this week. So fun. I think the one that is calling my name now is French Quarter. I love black and white with pops of color. Thanks for a chance to win. AH HANGING ON FOR THAT PRIVATE RESERVE KEEPING ALL TOES AND FEET CROSSED. Cherry Truffle... Some nice lines totally. Thanks for fun chances towin.. Savvy Davvy is my favorite! I could see myself making a cute mini album and some great cards! French Quarter all the way. Although they are all beautiful, I think that the French Quarter would be perfect to make cards with. Thank you for another chance to win the Private Reserve. My daughter and I would love to attend. I like the Savvy Davvy and would use it for accent on cards. Love the colors. I also like the black and white but not as universal. My favorite new paper line is Miss Morgan hands down! I love so many quick quotes products this is just one more to add to my collection. I would create some great layouts of me and my sis at the scrap convention and some of my beautiful nice's. Thanks, Heather Hoyt. Savvy Davvy is a new favorite paper line for me. I have used for cards as well as layouts! Hard to Choose....Miss Morgan is fav fave. They are all stunning, but got to say French Quarter is by far my fav. 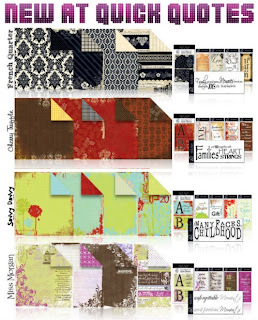 Love Savvy Davvy and would love to use it for layouts and a mini. Thanks for the fun givaway! I love the deep dark colors in the new Cherry Truffle. So pretty. I would create some fun fall layouts of my boys. Thanks so much for a chance to win. I love the deep rich colors of the cherry truffle paper line. Hard choice....they all look good but I think french quarter gets my number one vote! Cherry Truffle is my favorite new line of paper. I LOVE the rich colors and think it would be perfect for a family album. Stacey painter say miss Morgan for a day at the park and of course to make cards. Miss Morgan is my favorite. I love the combination of colors. It would make a great page layout or album for my two little girls. It is a toss up between Miss Morgan and French Quarter. They are both so beautiful and would be used for different purposes...Miss Morgan would be great for some girls night out photos and French Quarter would make a gorgeous addition to my wedding album!! I love Miss Morgan, and it would be perfect for my mini album I am about to start! My favorite is the French Quarter. I think it looks very sophisticated. I actually have these flower and butterfly embellishments that I'd found and loved and think they'd go perfect with this paper line! I can't wait to get some and see what I can do!! My daughter loves the black and white look and I will probably make a canvas she can hang in her living room where it will be a perfect match! It's a toss up but I think French Quarter is the winner for me! All the collections are versatile but I'm definitely drawn to the black and white's in FQ. Love the Miss Morgan! So much fun! And I could see so many LO's already being made! THanks so much! I think I would have to say Savvy Davvy since, #1 the colors are beautiful! and #2 I already have Miss Morgan (purple is my fav color!) I'm making a wedding scrapbook for my son and DIL so I would probably use the pages in that album. Its a tough call between French Quarter and Miss Morgan! Just can't decide so I'll have to get them both - hopefully THIS Weekend at Scrapbook Expo Santa Clara! French Quarter for a wedding album and Miss Morgan for my daughters album! Thanks QQ! The Quick Quotes classes are always my favorites at convention. Going to Private Reserve would be a dream come true. I just love the rich red/brown mix of the Cherry Truffle. I picturing in my mind using it for a layout of my daughter horseback riding. But I'm leaning towards using the green/purple mix of the Miss Morgan for my next layout - I just LOVE purple & green combos! Miss Morgan is my favorite new line. PURPLES how wonderful. I plan to use it in cards, pages, embellishments, however and whenever I can! If only one line can be chosen, Miss Morgan wins! Fell in love when my Club Q kits arrived! French Quarter is my fave,It would make a beautiful wedding album! I love the colors of Miss Morgan but French Quarter is speaking to me! It's telling me to scrap my old family photos and to record some of my French heritage. Thanks for all your generous give-aways! Like Miss Morgan. Worked with French Quarter at CKC with the make and take. It was Fab too! I love the french quarter paper. Works great on lots of different layouts. I would love to win. Thanks Quick Quotes for doing all the give aways. really? I can only pick one. Ok then French quarter is my fav. I can use this line for almost any project, especially a halloween layout... Thanks for the chance to win an amazing prize.. I would love to win a chance to go to private reserve.. Since I can only choose one, I will have to say French Quarter! I love the Miss Morgan also, love the colors. well, they all speak to me... lol however, as purple is my favourite colour, I would have to say that Miss Morgan is my favourite!! These would be the perfect papers to do up a new mini album using my bday present to myself - Elegant Edges!! I have had my eye on your kits since I found your blog; however, am only working part time right now so they have to wait... I would love if you picked me!!! scrap happy!!! ok so I forgot to leave my name and also let you know that my sister lives in New Jersey and will be visiting me in September and she would love to have my prize delivered to her!!! I like French Quarter because it matches my wedding invitation. Perfect papers to do my wedding album. Rich colors of Cherry Truffle are great for a family album. Father-in-law recently celebrated retirement and this might be just what I'm looking for. Hi girls!! I really like Miss Morgan looks like fun paper! I would have to do a mini of my kids for my dad who lives in W.V. We live in Washington, so he doesnt get to see them much. Thank you so much for the chance to win!! All 4 are just outstanding- but Miss Morgan is my very favorite one! Lovely lines! I love Miss Morgan- great colors! I have to say my favorite is Miss Morgan--ANYTHING with purple is my favorite. BTW, love the new purple ink pads. Got mine at CKC in Valley Forge. Hope I win!! I think French Quarter would be my fave. Love the elegance. I just love the Miss Morgan paper line. I have never been to a private reserve, but would LOVE to go! Thank you for the opportunity!!! Savvy Davvy-- my favorite. Very bright colors- I would love to do some silhouete photos and maybe some b&w photos on this paper. Love it-- great job! I really really really want that prize! My sister and I will go-- we both totally NEEED IT! I like them all very much but if i have to pick today it would be French Quarter. I really like the Cherry Truffle! They are all beautiful, but I tend to pick the Cherry Truffle colors over and over again in my scrapbooking. Such warm and cozy colors!! !I will definitely be using these in my fall and winter scrapbook pages! Just gotta love the QQ Savvy Davvy Paper line...the colors are great for little boys or girls! Knowing that the QQ papers are patterned and named for family speaks to me....I enjoy putting together scrapbooks for each of my foster children and this new line will be great for my next project. Memories can fade but not the QQ papers...Savvy Davvy will showcase and protect the memories of children for many years giving them something colorful to look back on! I love them all but, I think my favorite would have to be the Cherry Truffle. The rich deep colors are absolutely beautiful! All of them are wonderful but I have to say my favorite is Miss Morgan because it has Purple. My favorite color is purple and my 3 year granddaughter's favorite color is purple. I can just see her beautiful picture on a layout. Can't wait to see the papers in person. I Love the Miss Morgan paper line!!! I would LOVE to go to a Private Reserve too!!! How can you ask us to pick from such amazing collections?!? If I must I would say Miss Morgan because of the gorgeous colors. Love French Quarters versatility, Cherry Truffle is just so rich and yummy and Savvey Davvey speaks to that part of me that loves bright fun colors!